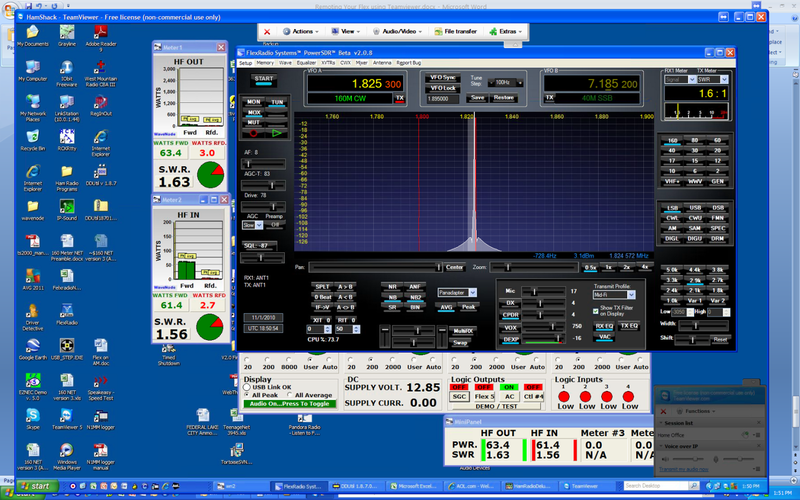 The Flex product is a PC based user interface (and also a software defined product) using the PC to control the radio and define the filters, etc of the radio. This makes it easy as using a remote desktop product would appear to be the only thing that is required. However, we still need to get the audio connected to the radio. 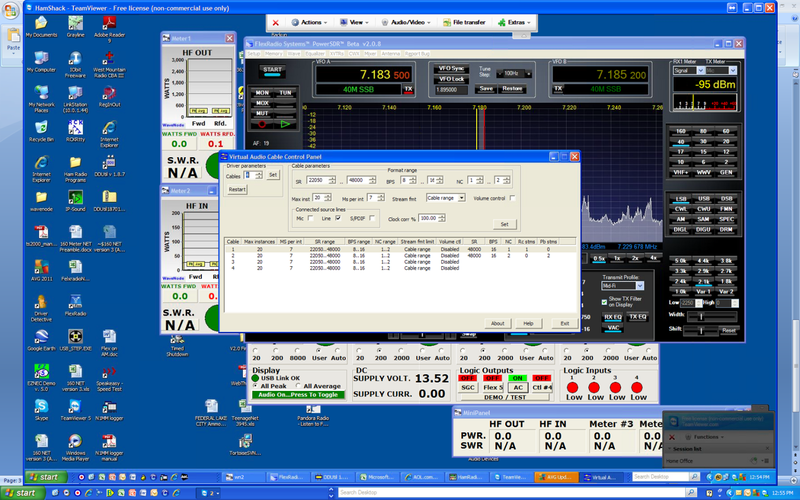 In the past, I have used a VPN connection to my home network, Windows Remote Desktop, and a VoIP product called IPSound. I had a lot of success with it at first, but there are certain anomalies with IPSound that cannot be resolved, and I moved on. IPSound requires a fixed IP address and most people have dynamic addresses. The greatest success I have had is with a remote desktop product called TeamViewer. 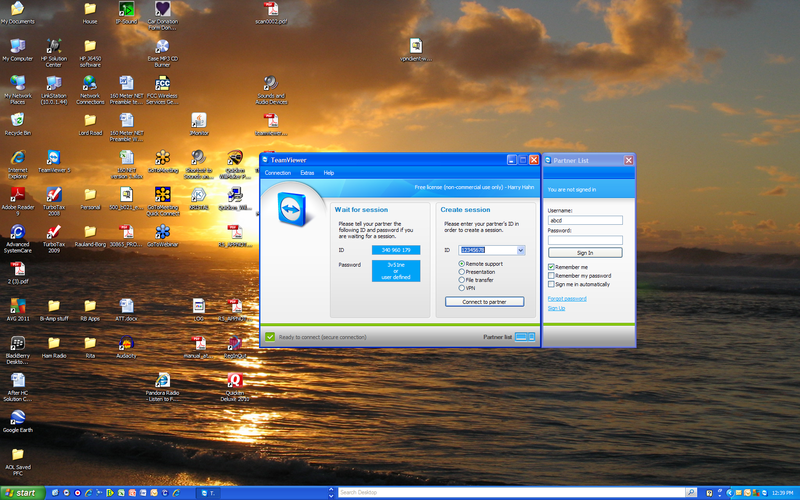 TeamViewer is a free product for a non-commercial user and it can be downloaded at www.TeamViewer.com. The other GREAT thing about the TeamViewer product is that recent upgrades to their software provides a VoIP tunnel, right within the product that can be “mapped” to the audio input of the Flex. This allows you to make an audio connection and control the computer with a single product. You however are required to purchase Virtual Audio Cables from an online store. The VAC product allows you to “patch” audio inputs and outputs from the Flex and your computer audio. It is much like using physical audio patch cables, but they are virtually done in software (thus Virtual Audio Cables). Go to http://software.muzychenko.net/eng/vac.htm purchase the software. PLEASE NOTE THAT THE TRIAL VERSION HAS TEST AUDIO THAT KEEPS REPEATING ON IT AND IT IS NOT USABLE FOR ACTUAL FLEX OPERATION. You need to buy it. I run version 4.08 with no problems. The current version is 4.10. Download and get TeamViewer free operating on your remote computer. Also download and get TeamViewer running on your local (ham shack) computer. When this process is completed using all of the instructions provided by TeamViewer, you should have an Icon on the bottom right hand side of your tool bar by the clock. By clicking on the icon, you will get a screen that allows you to sign into the TeamViewer and then log on to your remote computer. Follow their instructions to do this. You can set up a permanent password to easily log in again, or log in automatically when you click one button. When you have successfully logged in, you now see your remote computer screen, as you can see mine here. You will also see some other programs that I have running in the background that I will explain later. You now can see the PowerSDR screen that you can operate just as you do when you are sitting in front of your PC at home. The only thing you lack now is your audio connections. Your Virtual Audio Cable program was previously installed ON THE HAM SHACK COMPUTER. Using the instructions provided with that program, create some “virtual patch cords” to patch audio with the VAC program. I created 4 of them here. All I require to use for the TeamViewer patching is cables 1 and 2. Go to PowerSDR program and select SETUP / AUDIO / VAC…. You should see the following screen. Make sure that the driver is Windows Direct Sound and that the Input is set to Virtual Audio Cable 1 and the output is set to Virtual Audio Cable 2. You can turn on the VAC operation in this window or from the front panel of PowerSDR. Also note that you can set other VAC parameters in this setup window. One of the most important will be the TX and RX gain controls as when you are using VAC, the front panel SDR gain controls for mike audio and receive audio are ignored on VAC. OK, now let’s get the audio working over the TeamViewer VoIP connection. 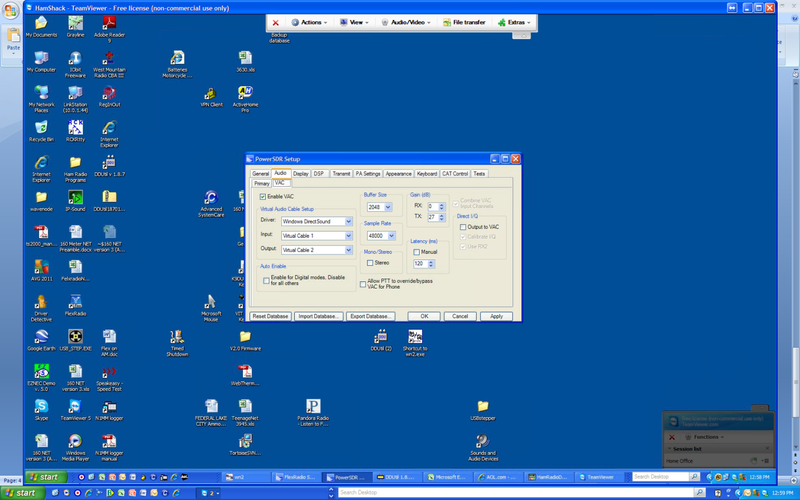 In the top window of the local computer, you will see a TeamViewer Tab in the center of the screen. Click on the Audio/Video and then click on VoIP. This produces another small window in the upper right hand side of the screen on the local computer. Now your screen looks like this. This new box is where you set the audio input and audio output of the LOCAL COMPUTER. You are now seeing the same looking screen on the Ham Shack computer. Do the same thing. That is SET THE AUDIO INPUT AND OUTPUT OF THE (HAM SHACK) COMPUTER. 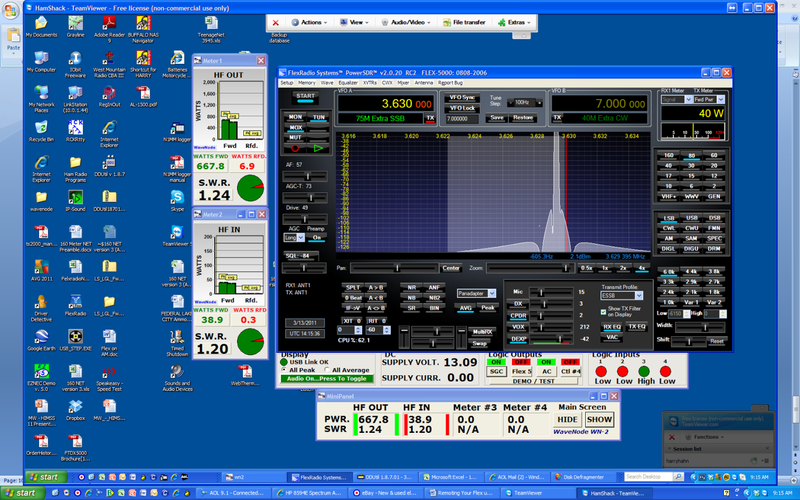 This has to match the settings in Power SDR VAC. In this case, Virtual Audio Cable 1 is set as the Speakers and Virtual Audio Cable 2 is set as the Microphone. 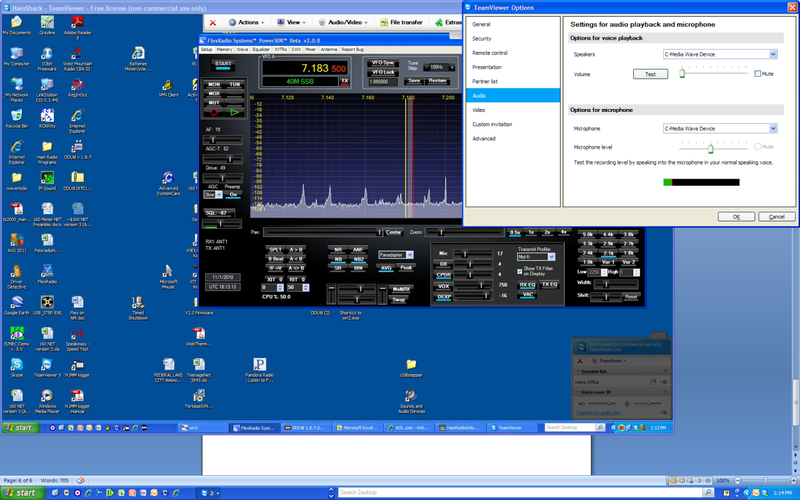 Now last and very importantly, you must click on each one of the computer screens (Local and Ham Shack), “Transmit my Audio Now”. 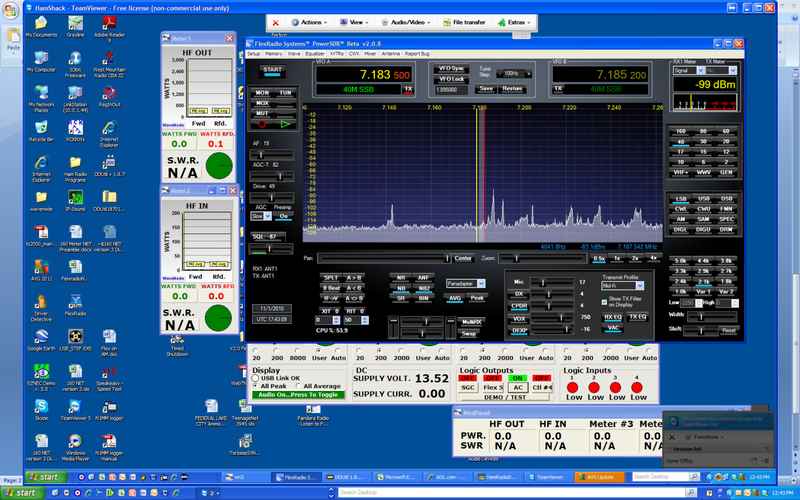 At this point you will hear the Flex audio in the local computer’s selected speakers (headphones) and when you click on the MOX button on the SDR front panel, you will be able to transmit the remote audio. 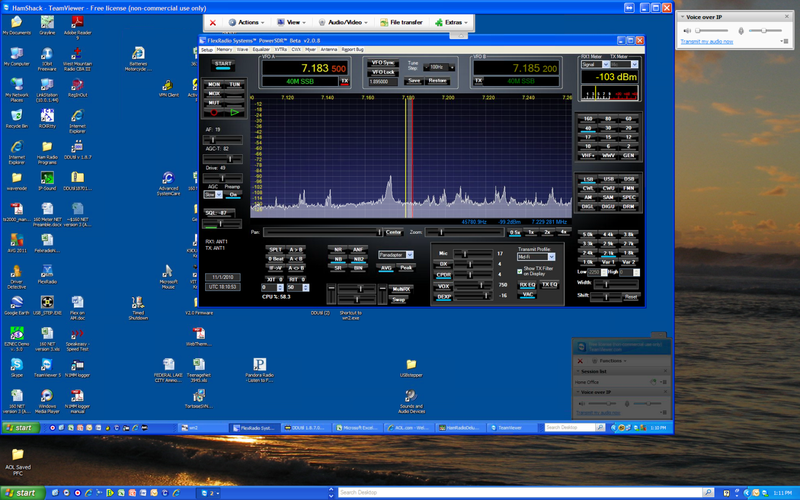 Using a combination of the TeamViewer audio setting screens and the VAC settings in Power SDR, set a comfortable listening and transmit audio without over-driving the input. “Tweak” your audio at the remote site using the EQ settings of the Power SDR and then you should save the settings within your Power SDR favorites (database) as “Remote”. You can listen to you transmitted audio remotely by listening to it using the MON (Monitor) button. However, hearing the latency over the internet will probably produce an echo that is not pleasing for your normal operation. However, it does allow you to set a good transmit level and EQ setting. Sometimes I record a WAV file and play it back using the Flex capabilities and this allows you perfect audio settings. Some people prefer VOX and this is also possible using the remote set up. Just select VOX and you can let the Flex transmit and receive using VOX. This usually works best for remote operation as it lets the Flex automatically transmit and receive to the transmitted word, rather than when you think you need to go back into receive. With the delay (or latency) of the internet, sometimes it can be seconds, so this way you don’t cut off words when you manually think that you are done with a sentence. Use either operation to meet your situation. I also had some other things on my desktop that you saw before. I am a huge promoter of the Wavenode WN-2 product www.wavenode.com. In addition to using it to see my Power out, it controls other things. I use it to control the power on/off, Power Amp On/Off, FLEX-5000 on/off, antennas on/grounded, etc. The Wavenode in this screen shows my Wavenode settings and my Power IN and Out. In this example, I am only showing the exciter power in both the in and out of the amp. My FLEX-5000 has a reed relay that I installed across the power control switch of the FLEX-5000, which when operated, by the WN-2 is like pushing the front panel 5000 power switch. A feature that Al Burros of Wavenode added for the Flex users is momentary operation of the soft buttons on the Wavenode PC interface. When you momentarily click on the Flex button, it activates the reed relay in the Flex, which simulates you pressing the front panel switch of the FLEX-5000 for ON or OFF operation. You can also wire up to button “lights” if you want to see what is on or off on the User Interface as the WN-2 has logical inputs. I can see when my SGC power amp fault light has “tripped”. In this screen shot, I have turned on the SGC amp. It is a perfect companion to the FLEX-5000 and I highly recommend it. It has all of the protection circuits that you require for remote high power operation (it is meant to run in a trunk of a car!! ).The SGC-500 has a very easy on/off/reset logic input. That logic input is controlled by the Wavenode WN-2 logic out and when turned on, now can produce as much as 700 watts out, when you use the 16 volt SGC power supply. In mobile use you only get 500 watts at 13 volts. This is very clean RF power. I also run fans on the heat sinks of the SGC continuously when it is turned on. The other utility that is a must for remote operation is DDUtil by K5FR. This is a tremendous tool to use for automating other things, like antennas, other switching utilities. Etc. Most importantly to me, it clones your FLEX-5000 RS-232 output signal to feed multiple devices, such as antenna switches and my Palstar AT-Auto. My very latest endeavor has been to use my iPad to control my FLEX-5000. I totally love this operation. The iPad fires up fast, it is very easy to use, and has great audio. The only down side is that the TeamViewer app for iPad does not allow the VoIP tunnel. Therefore you have to use an alternate method of getting the audio to the ham shack computer. I use Skype, and have great audio reports with it!! Do everything on the ham shack computer exactly as explained above. The only difference now is that you must “map” the audio in and out from Skype using the Virtual Audio Cables to PowerSDR. Download the TeamViewer app from the app store on your iPad. The setup is very straight forward. You will log into your home PC similar to what you do on a PC, but using your iPad. The big difference is that once you set up your preferences and TeamViewer remembers them on the iPad, it is very simple. Download the Skype app from the app store. You will have to use a different Skype name on the iPad than your home computer. Go to Tools/options/audio settings in the Skype windows. On your home PC, Match the audio settings of the audio output of your radio to the audio input of Skype. MATCH the audio audio input of your radio to the audio output of Skype. My sequence is to go on my iPad Skype first, then call my home machine. After I hear ringing on the iPad, I go to the TeamViewer app on the iPad (do not close the Skype app) by simply hitting the left button on the iPad screen one time and touching the TeamViewer Icon on the iPad screen. Go through the sign on procedure for TeamViewer. When you see your home PC screen, you will see the Skype ringing. Click on the Skype answer button on your home screen. If your VAC is set up right, (the VAC button clicked on your 5000, etc) you should hear audio on the iPad. You can use the built in microphone on the iPad, but the audio may sound “boomy” and needs to be EQ’d. This is my favorite operating position. It is a bar!!! I am having my beer, waiting on dinner and checking into one of my favorite nightly nets. All done while on the road at my regular job!! 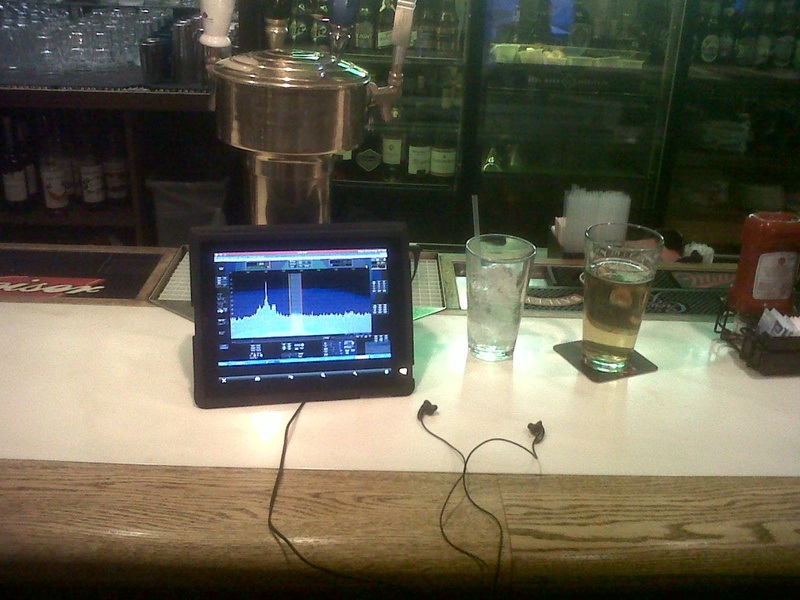 Note the ear buds on the bar. Use a standard set of Apple ear buds with a mike like for an iPhone for good audio. An Adobe Acrobat Reader may be required to open the file.You can download Adobe Acrobat from here. Rated 4 stars based on 9 votes. Article has been viewed 40,747 times. Execution: 0.672. 11 queries. Compression Disabled.